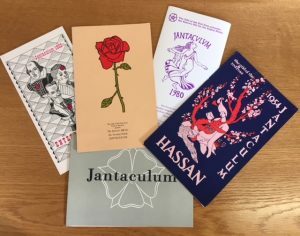 A selection of brochures and ephemera from the University History Collection. The Gild of the Red Rose was a literature and theatre society founded in 1897, by W.M. Childs. The group was open to staff and students, hosting dramatic performances and readings for many years. The group was not disbanded until the late 1980’s. The Gild was built on customs, titles and phrases that may be unfamiliar today. The committee was called the ‘Curia’ and the functions included Gemots, Morrowspeches and Jantacula. Mr Childs was inspired by the sixteenth century Gild Merchant of Reading when he founded this society. The University History Collection holds brochures, photographs and other ephemera relating to the Gild. These archives can be accessed by visiting the Reading Room at the University of Reading Special Collections in the Museum of English Rural Life. Programmes and photographs from this society will be displayed at the end of February. The archives form part of a third year BA Museum Studies project, where myself and fellow students have chosen to exhibit the theme of ‘Belonging’. Choosing a theme and title for the exhibition was not an easy decision, but eventually we agreed upon five sub-themes: Belonging to Conflict, Belonging to Culture, Belonging to Community, Belonging to Countryside and Belonging to Clubs. We chose these sub-themes because they each had a strong link to the vast university collections. Throughout this project, I focused mainly on the ‘Belonging to Clubs’ case, and quickly established a link between the archives and this sub-theme. Clubs like the Gild of the Red Rose created a sense of belonging by helping students to find like-minded communities. The Gild archives are fairly extensive and span decades of the university’s history, and the array of colourful programmes and photographs became an obvious choice for this case. Working with the archives was an amazing opportunity, and researching objects such as scrapbooks and theatre song sheets often felt like opening the door on the university’s past. I was so impressed by the variety of archives that the University Special Collections hold, and much of my inspiration for the exhibition developed from visiting. I’m delighted that I have been able to view a snapshot of the life of former students, and hope that the ‘Belonging to Clubs’ case accurately represents the views of those who were a part of this fascinating society. The Gild of the Red Rose material will be located in a case outside the Ure Museum on Whiteknights campus, while other sections of the ‘Belonging’ exhibition can be found at the Museum of English Rural Life, the Archaeology building on Whiteknights campus, and Reading Central Library. The exhibition closes on 13th April. Did you belong to the Gild of the Red Rose? We’d love to hear your memories.